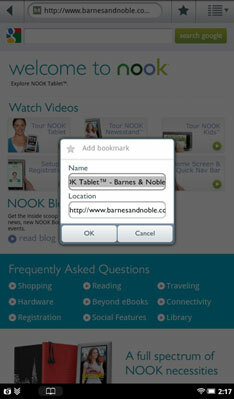 On the NOOK Tablet Web Browser, like on any browser, you can mark your favorite sites so you can easily get back to them. When you no longer need to reference that page, you can remove the favorite (also known as a web bookmark) from your tablet. Press and hold anywhere on the page. Do it anywhere except sections that are active (such as links or fields on a form). A good choice is usually a blank piece of the screen. From the menu that appears, tap Bookmark This Page. A dialog box opens. And yes, it says Bookmark (at least in the first release of the software). It’s a Bookmark/Favorite. Enter a name for the bookmark. Accept the web address (URL) for the current location. Or you can edit the name via the keyboard. Tap in the Name field. Type something that identifies the bookmark. The browser shows three tabs: Bookmarks, Most visited, and History. The Bookmarks tab is set to automatically open, and you will see rows of bookmarked web pages. Tap the Add+ thumbnail in the upper left of the window. Press and hold the thumbnail for the bookmark you want to delete. Tap the Browser check box so that it’s unchecked.